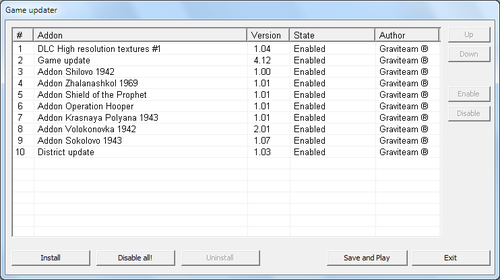 The game features a built-in utility for installation of updates and mods. It is run by clicking on the "Update" item or the game version number in the Main Menu, using the "Game Updater" shortcut from the Start menu, or using update.cmd from the game folder. The proper order of updates. Changes to resources made by the updates with higher priority get advantage over changes by the updates of lower priority. The main game resources have the lowest priority. You can use several updates changing different resources or a common subset of resources simultaneously. Usually, this means that updates and DLCs should be in the order of their release date (the only exception currently is High resolution textures DLC - it should be above everything), and mods should be above the patch. See the picture above. If problems occur after installing an update, disable the update. Every update is installed into its own folder and its resources do not overwrite resources of the main game or of the other updates. The updates are installed into data\k43t\<update name> folder. User must have write access rights to this folder for the installation. When you install, enable and disable updates, or change the order of updates, all tactical battle saves of each profile will be deleted. Note. System updates (from the developers) cannot be disabled, they can only be removed. In the file select window choose the appropriate type in the file filter (default is "Addons (packed) *.gt2extension" - standard type of all new Graviteam updates and DLC) and browse to the update or mod file. Wait for the install to complete, the update (mod) will appear in the list. Press the "Save and Play" button. Install the latest core update: gtos_cu_jun15_int.exe (or from GamersGate). Install the latest patch: gtos_jun15c_patch_eng.gt2extension (or from GamersGate). Optionally, install the terrain update ("Polygons Update"): apos_upd_tar_rak_mar13_eng.gt2extension (you will need a download manager for this, or download it from GamersGate). Note. This step is not needed if you have installed the game using the new sep13 game installer from GamersGate or from Steam. Note. Only the latest patches and updates are required, no need to install previous versions first. Antivirus is not blocking the update and/or the game. Note. The following is not relevant if you have installed the game using the new sep13 game installer from GamersGate or from Steam. Windows Vista and later have restricted user permissions for Program Files. If you don't know how to handle this, it is better to not install the game into Program Files. Verify that C:\Users\<Your user name>\AppData\Local\VirtualStore folder (AppData folder is hidden) does not contain the game folder in it, otherwise delete it. This page was last edited on 29 February 2016, at 18:30.